Shopping is an essential part of travel. Tourists purchase local specialty items that are only available in certain regions and have an authentic taste. Since some food items have a short shelf life, they require extra care and attention. Here are some Korean traditional food items that are popular and have a relatively longer shelf life..
Kimchi is Korea’s representative healthy side dish and is made by fermenting salted cabbage, radish, fermented fish sauce and various vegetables in a red chili pepper sauce. The types of kimchi vary by region, season, and even its making process. It has more than 180 varieties, including baechukimchi (kimchi), kkakdugi (diced radish kimchi) and yeolmukimchi (young summer radish kimchi). Baekkimchi (white kimchi), a variety made without red chili pepper sauce, is popular among people who dislike spicy foods. Made from a variety of vegetables, kimchi contains an abundance of dietary fibers and is low in calories. It is also a source of important vitamins and minerals. Kimchi started gaining international acclaim as a souvenir for its medicinal qualities. Many studies over the years suggest that the lactobacillus in kimchi helps strengthen immunity to bacteria and cancer. Vacuum-packed kimchi can prevent any leaks and is recommended for travelers planning to take it home passed the stringent customs. Various vacuum-packaged kimchi products are readily available in department stores, supermarkets, convenience stores and duty free shops. Gochujang (Korean chili paste) is a traditional fermented condiment made with a combination of sugary, salty and spicy tastes. It is a chili paste made from fermenting a mixture of rice powder, Korean chili pepper powder, Korea malt oil, fermented soybean powder, and salt. Gochujang contains an abundance of nutrients and the spicy taste that comes from capsaicin stimulates appetite and improves digestion. Gochujang is packaged in plastic tubs or tubes with varying degrees of spiciness and can be found in supermarkets, convenience stores and duty free shops. The standard unit of spiciness, running from one to five, is ‘GHU’ (Gochu-jang Hot taste Unit). This unit system is handy for purchasing gochujang; the higher the unit, the stronger the spiciness. Gim (laver) is a regular side dish in Korea. It is crisp and tasty and is often seen sprinkled atop a range of dishes, adding its own unique flavor and texture. Gim is made from dried seaweed that contains a variety of vitamins and minerals. Five pieces of gim contain the same amount of protein as one egg, and the amount of vitamin A in one piece is equivalent to the amount found in two eggs. In particular, Korean gim has received much enthusiasm from international food connoisseurs for its unparalleled quality. Gim can be bought in bulk and is often well packaged, making for a luxurious souvenir. Gim comes in a variety of types and packaging methods, which can be easily found in supermarkets. Since it is particularly susceptible to moisture and can easily go stale, it should be stored in an airtight container or bag. Insam (Korean ginseng) is a root with a bitter taste and strong flavor that is named after its shape that resembles a human body. Korean ginseng in particular is known worldwide for its amazing health benefits. There are three types of insam: susam (fresh ginseng), which is unprocessed and picked right out of the field; baeksam, which is dried insam; and hongsam (red ginseng), which is steamed and then dried. Although insam contains plenty of amino acids, vitamins, and minerals, its health benefits cannot be fully explained without mentioning saponins. The saponins in insam are usually referred to as ‘ginsenosides’. Ginsenosides boost immunity and help fight cancer as well as provide a speedy recovery from fatigue. There is an assortment of insam products on the market. Hongsam is available in liquid form, extracts, capsules, and tablets. Insam candy and jellies are popular as well. Insam is a high quality souvenir, and can be purchased in department stores, supermarkets, road shops and specialty shops. Also, most products have been packaged to enhance portability and convenience. Ramyeon, or more commonly known as ramen, is a type of Korean instant noodles. They are the most adored instant food in Korea as a good substitute for a hearty meal with a reasonable price. As such, they have become a popular souvenir for tourists to take home and share with friends and family. The noodles come in a plethora of flavors from non-spicy broths to stir-fried noodles with cheese or spaghetti flavoring; the most common are the spicy ramyeon. Recently, extremely spicy noodles have become the new trend in Korea’s instant noodle market. Single packets or cup noodles can be found at any small supermarket or convenience store. Large packets with bundles of five can be purchased at large supermarkets. 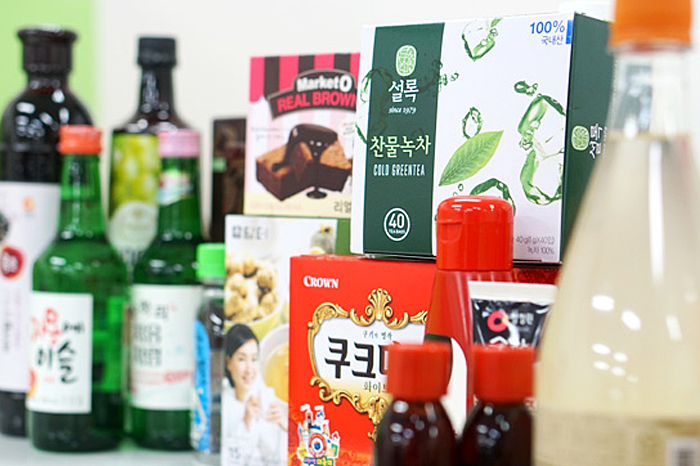 Recently, DIY home baking supplies in little boxes have been setting a trend in Korea. DIY baking supplies, also referred to as ‘mix’ in Korean, is tailored to the needs of beginner bakers, as flour, sugar and other dry materials are precisely measured and packed. Packages come in a wide range of products, including basic baked goods such as cookies, breads and cakes as well as hotteok (sugar-filled griddle cake), haemulpajeon (seafood and green onion pancake) and even ice cream, which all add to the fun options to choose from. Depending on the cooking mix, special kitchen utensils and equipment, such as ovens, may be required. The mixes can be purchased at convenience stores or supermarkets, but mega-sized department stores or supermarkets, in general, have a larger assortment of options. Korean snacks are not only tasty but also nicely packaged thus very popular souvenirs. Snacks come in a wide range of flavors, from sweet snacks perfect as desserts, to salty snacks that stimulate your appetite and spicy snacks that are popular among Koreans. Korean consumers have recently become more health-conscious and cautious about the ingredients that are used in snacks. As a result, many new products with high-quality organic ingredients are readily available as well. The most representative traditional snacks in Korea are tteok (rice cakes) and hangwa (traditional Korean sweets). In Korea, tteok can be eaten as everyday snacks, but are usually served on special occasions such as weddings, birthdays, and anniversaries. They are most commonly found in supermarkets during Seollal (Korean New Year’s Day) and Chuseok (Korean Thanksgiving Day). Rice cakes have a sweet filling or outer layer and are made from steaming or boiling grain powder then shaped by hand into different shapes. In particular, the chewiness and soft texture is its unique aspect. Hangwa is made from flour or rice powder mixed with honey or Korean malt oil. Depending on the individual recipe, hangwa can have a variety of shapes, flavors, and textures. Yugwa (deep-fried sweet rice cake), yakgwa (traditional honey cookie), jeonggwa (fruits, plant roots, and seeds in sugar) and dasik (tea cakes) are the main types of Hangwa. Hangwa snacks are readily available in numerous specialty stores and may also be purchased in department stores or supermarkets. Yugwa and yakgwa are individually wrapped and packaged in boxes which are great souvenirs. Fruit vinegar is produced by acetic acid bacteria from fermented fruits. It has a sweet and sour flavor and is known for its health benefits, such as skin care, and effectiveness in relieving fatigue and constipation. The most common method to consume fruit vinegar is by mixing it with water. A 3:1 ratio of water to fruit vinegar is the general rule of thumb; the ratio can vary depending on personal preference in taste. A variety of flavors are available such as pomegranate, blueberry, green grapes, lemon, bokbunja (Korean black raspberry) and more. The vinegar can also be used to make fruit soju to give it a smoother finish. Fruit vinegar can be purchased in varying sizes from bottles of 50mℓ to 500mℓ, 900mℓ and 1.8ℓ. The shelf life is approximately 18 months from the date of manufacture. It can be stored at room temperature out of direct sunlight but needs to be refrigerated after opening. Much like beer in Germany, wine in France, and vodka in Russia, makgeolli and soju are the representative alcoholic beverages of Korea. Among Korean traditional alcohol, makgeolli has the longest history. It has a milky, opaque color and a low alcohol content of 6-13%. It is relatively low in calories and high in protein. Also, it contains high levels of yeast and lactobacillus, giving it a nutty and sweet flavor. The most adored drink in Korea is soju, with an alcohol content of about 20%. Its popularity is in part due to its relatively low price. Recently, fruit-flavored sojus have been gaining popularity among light drinkers. Makgeolli and soju can be easily purchased in convenience stores, supermarkets and corner stores from even the smallest of towns. The packaging of soju varies from drink boxes to plastic bottles. As alcohol purchases by minors are strictly prohibited in Korea, a form of photo identification with the date of birth is required. Healthy and delicious traditional Korean teas are popular among tourists. Korea’s traditional teas include nokcha (green tea), yujacha (citrus tea), maesilcha (green plum tea), mogwacha (Chinese quince tea), omijacha (five-flavor berry tea), saenggangcha (ginger tea), and daechucha (jujube tea), as well as sikhye and sujeonggwa. Nokcha is made from tea leaves that have a bitter and refreshing taste. The green tea leaves are dried and roasted and are usually enjoyed steeped in hot water. Green tea in powder form or teabags is also popular for their convenience. Yujacha, maesilcha, mogwacha, omijacha, saenggangcha and daechucha are made from fruits sliced and stored with sugar or honey. In winter, it is enjoyed with hot water and served chilled in the summer. Recently, fruit tea ingredients are also popular toppings for patbingsu (shaved ice with red bean toppings), a summer desert in Korea. Sikhye is made of sweet rice and malt and has a delicate and smooth taste. It also contains ginger, cinnamon, and dried persimmon boiled in sugar water. It is then served chilled, Sujeonggwa tastes sweet with a kick of spice. These dessert drinks are frequently served in Korean restaurants which are known to aid in digestion. Traditional teas are available in supermarkets, department stores, and convenience stores. There is a wide variety of green tea products sold in the form of powder, teabags, or whole roasted leaves. Yujacha, mogwacha and saenggangcha are sold in bottles but also come in the form of powder, packets or tea bags. Sikhye and sujeonggwa are sold in cans or bottles.